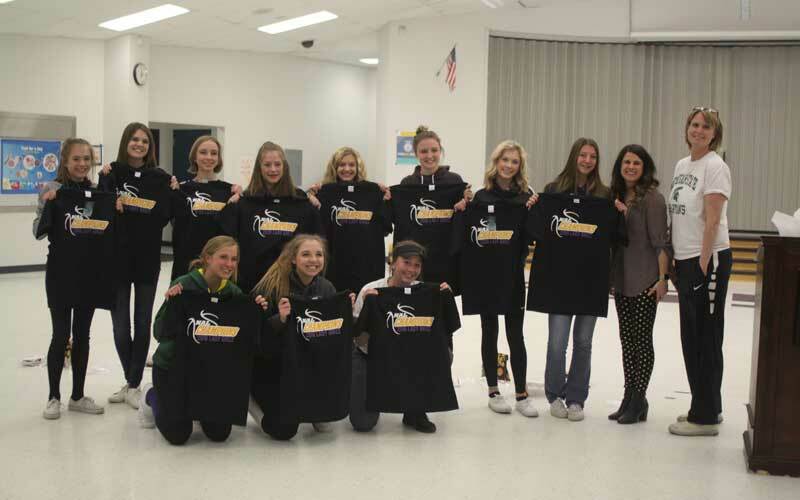 On Monday, March 22, the Lassen High School girls’ basketball teams held their annual awards ceremony to recognize the hard work and dedication seen from the Lady Grizzlies throughout the 2017-2018 season. All three Lady Grizzly teams had a fantastic season as both the freshmen and junior varsity teams were the undefeated champions for the Northern Athletic League, and the varsity Lassen ladies finished in the final four for the section playoffs and in the sweet 16 teams of the California Interscholastic Federation State Girls Basketball Championships Division V Playoffs. 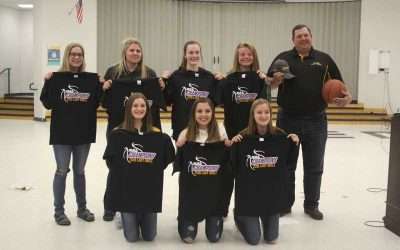 First to be recognized was the freshman team, coached by Tyana Zinn. Moving on to individual awards, Rylee Friddle was first to be recognized with her 4.0 achievement. Friddle was then immediately brought back into the spotlight as she was named Best Defensive Player for the freshman team. Friddle finished the season with 79 offensive rebounds and 32 steals on the season. Next, Tristen Struthers was named Best Offensive Player. She had 155 points on the season with a game best at 19. “(Struthers) sometimes played post for me while also playing a guard. No matter where she was on the court, she was always looking for an opportunity to score. Having watched her play in the past, I feel like she really found her drive to find the hoop this season,” said Zinn. Brianna Hawks was named the Most Improved Player. Next to be honored was Autry Satica for the Most Inspirational Award. “The most inspirational one is a sweet, quiet, laidback player. She is always there for her teammates without realizing her enthusiasm. They definitely all look up to her,” Zinn said regarding Satica. The Most Valuable Player Award was presented to Kennedy Hampton. “This player covered all of the bases. Numbers don’t lie; she had some phenomenal stats. 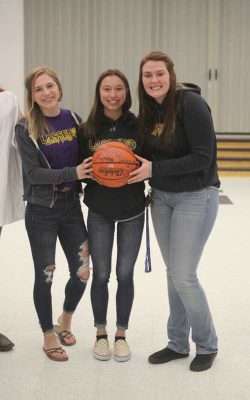 She had 176 points on the whole season with 18 being her game best, 61 steals, 23 offensive rebounds and 38 defensive rebounds,” said Zinn. The final award for the freshman Lady Grizzlies was the Ultimate Grizzly Award. The award was presented to Taylor Nethery. Zinn finished off the freshman recognition with praise for her team. “Before you is a talented and phenomenal group of girls. They are undefeated 2017-2018 league champions,” she commented. 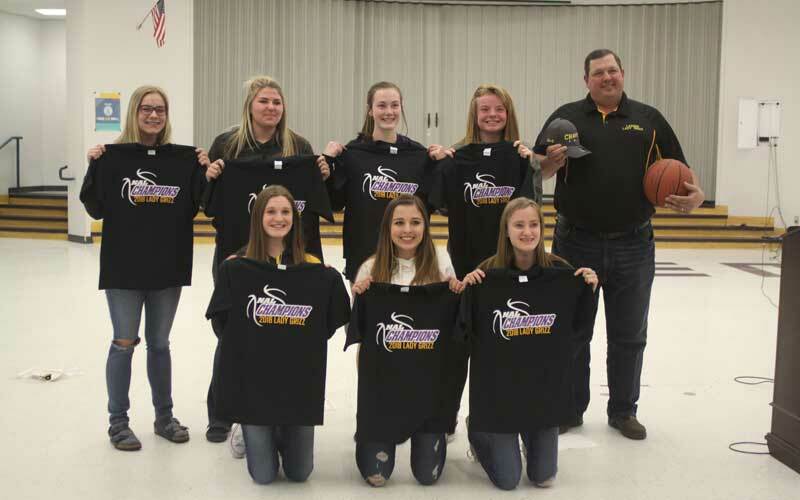 Next to be recognized for their success and achievements was the junior varsity team, coached by Jim Ernaga. Ernaga could not refrain from praising each and every Grizzly on the junior varsity team, both as an individual and together as a team. Ernaga said, “These girls truly are relentless. They are the best team I’ve ever seen at this level. These girls would do anything for each other during a game or anywhere else, and we truly are a family. The junior varsity Grizzlies had one 4.0 recipient as well: Ronnie Merrill. As for the team- and coach-voted awards, Ernaga began by presenting the Most Improved Award to Grace Gatie. Next in the spotlight was Grace Memmott as the recipient of the Most Inspirational Award. “Even when things weren’t going well, (Memmott) always had a positive attitude and always picked it up for everyone else,” said Ernaga. The award was presented to Hannah Langenhorst. Next, Caitlyn Crosby was awarded Best Offensive Player. “This player was clearly the top in all offensive categories. This player could shoot a three. This player could play inside. This player could play anywhere. Clearly she was our best offensive threat and we could use her in any situation,” said Ernaga in reference to Crosby. Merrill was brought into the spotlight for the Best Defensive Player. Finally, the Most Valuable Player Award was presented to Hailey Mena. “This particular player can run the show without me. She was calling the offense the whole time, always picking up the defenses and ran the show beautifully,” said Ernaga regarding Mena. Ernaga concluded the junior varsity awards with a last tidbit of praise before calling the girls in for a final team huddle. “These girls are the hardest working girls I’ve ever been around and again, we truly are a family. And I thank them for all they did for me. I appreciate them and I know they are going to have a great season next year,” he said. The varsity Lady Grizz team took the stage next. Head coach Jessica Larson opened the varsity recognition with some high praise for her team. 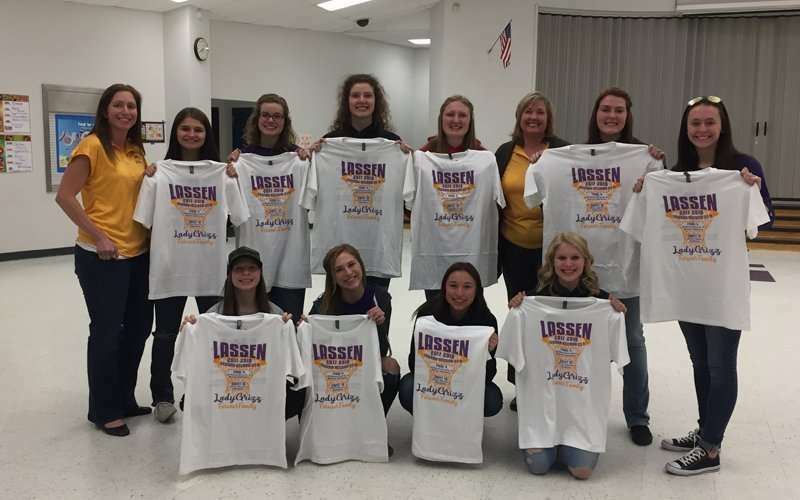 Larson said, “A few years back I started a curriculum about leadership and the girls and part of that is playing fearless and being a family. As for awards, Shelby Anderson was first to be recognized with the Most Improved Award. Next was Lainey Nevis, who was honored Best Defensive Player. “You grew in your confidence. You are a phenomenal player. You had 124 points on the season, Lainey. You were the number one assists on the team with 78 on the season, helping your teammates score, and you still pulled 124 for yourself. You were second in team steals with 72,” Larson said to Lainey Nevis. Ellie Stewart earned the Best Offensive Player Award. “Ellie has always been tall, so rebounding and scoring kind of comes natural for her, but getting hit at the varsity level did not. It really is a tough job to be in there, to be the girl that scores, and for them to double-team you and sometimes just maul you. But she handled it with such grace. 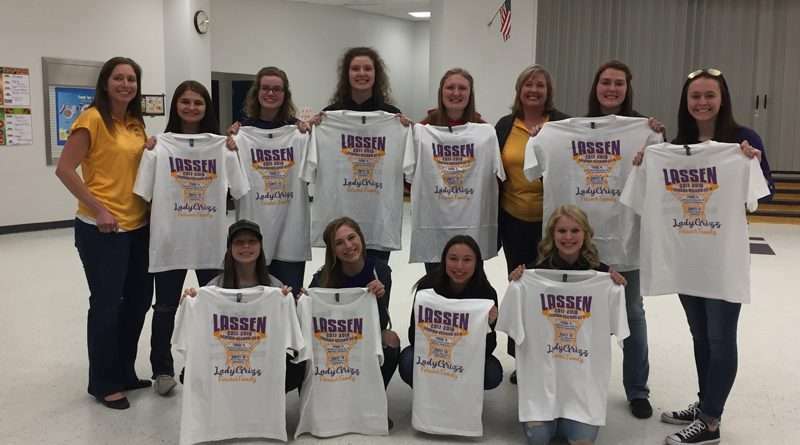 She is one of the most coachable kids I have on my team,” said Larson. Larson then brought the three senior players to the front of the stage. “Our senior leadership is pretty phenomenal. These three showed up early, they made sure to keep everyone in check and they lead our team with positive enthusiasm. We never had an unkind word or poutting fit from any of them,” Larson said. Dani Nevis was named Most Inspirational. Larson said, “She is an outstanding shooting guard and person. She is a phenomenal human being. She is third in the points on our team with 126. She was our number one free throw shooter by shooting 76 percent from the floor. She was third in steals with 59 all season. The Ultimate Grizzly Award was presented to Ava Steele. “What a responsible, positive team leader this young woman is. With all the practice we did, there was not one practice that Ava ever gave attitude or was grumpy at, and that’s amazing. Ava had 130 rebounds on the team, 38 steals, was one of our best defensive post players by far and had 112 points on this season,” Larson stated. Maddie Hampton was honored with the Most Valuable Player Award. Larson said, “She is an incredible ball player. Not only did we want her out there, but every coach admired her, admired her tenacity. They would say, ‘Oh my gosh, where did she come from?’ and I said, ‘She just loves this game,’ and it really showed on the court. This is another one who has a real passion for basketball. Maddie expects a lot of herself. She expects to get a steal and to be sure her team is all getting a stop on defense. I really think that Maddie sets the example for the whole team in practice and in games. In addition to team awards, the varsity girls also had three players presented with All-League Awards. Hampton and Stewart were both named to the First Team All-League, and Lainey Nevis was named All-League Honorable Mention. The final award of the evening was a Grizzly tradition: the passing down of the senior basketball. During the 2017 awards ceremony, Makenna Busse presented the ball to Dani Nevis, who was a junior at the time. The tradition of the ball is to pass it from senior to upcoming senior with each recipient signing her name. Regarding this year’s recipient, Dani Nevis said, “This decision was super hard to make. I can’t explain how much I love each and every one of you. The Lady Grizzlies ended a fantastic season with a fantastic awards night.